XLR Patch panel - to build or buy premade? I'm looking for a 16-channel XLR patch panel (1U, mic in) and was figuring I would just build it myself. I was looking at starting with https://www.parts-express.com/neutrik-n ... l--092-036 and https://www.sweetwater.com/store/detail ... kout-panel and then wiring the back to snakes with pigtails ready for me to solder up to the panel (plenty of experience there so I'm not concerned about the process). But weirdly, the added cost of all the loose parts and the snakes I've found (looking for one 8ch XLR M to loose ends and one 8ch DB25 to loose ends, both 6 feet) makes it seem a lot more expensive than if I just bought premade everything, which seems counter intuitive to me. So I could just go with something like this: https://www.sweetwater.com/store/detail/P16--art-p16 with two premade snakes (XLR F to M, XLR F to DB25 in the specs I need), and based on the prices I've checked, this plan is coming up cheaper. Thing is I usually like to build my own cables and things to save money. Does anyone have a site you recommend for parts like this, especially the snakes, where I could do it myself for cheaper? Thanks! 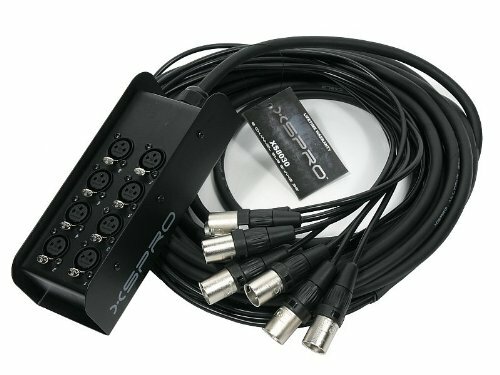 Re: XLR Patch panel - to build or buy premade? I dunno I don’t always agree about saving money on your own cables. The advantage is more towards custom lengths and such...otherwise i don’t have time to build a lot of cables. In terms of keeping costs down you’ve also got to look at quantity breaks...if you only buy what you need now you will pay more, but if you buy quantities of common connectors that can save a bit. I typically make a spreadsheet, and compare their prices. Keep an eye on price breaks - sometimes they kick in sooner at different vendors. Parts Express almost never have the best price. I'd also consider quality - I can make my own cabling, with trustworthy parts, for less than equivalent assemblies. I could also buy something with similar specs, but with less solid pedigree for less. We live in a golden age of imported stuff of questionable quality. I'm pretty sure that linked ART box isn't using Neutrik or Switchcraft connectors...though whatever it's got might actually be fine. If cost is the paramount concern, then Monoprice, Amazon Basics and Seismic Audio are worth a look. I mean, their connectors look kinda like Neutrik, right? "Cat fur, to make kitten britches." Plus one on haveinc. At the time I built my patch panel and snakes they were the best on price for components. But when you don’t need neutrik and mogami, I have had pretty good luck with monoprice stuff...and it carries a lifetime warranty so if it fails... I’ve never sent a monoprice audio cable back. I’ve had their phone cables wear out, but I don’t fault them for that as much as stupid design in general for phone charging cords (now I charge wirelessly...with a monoprice brand charger). When I built my place I had Redco build the panels. They have a cool site feature where you can mock up your panels starting with the size, then all of your connector types, then you can add any custom labeling you want (i.e. Iso 1, Live Room 1 etc). If I remember you can save your design to work on it later and it gives you a running tally of cost. I then soldered everything myself using the snake cable I'd also purchased from them. The cable was expensive enough to make the panels feel cheap if I recall correctly. Thanks everyone. Redco's panel designer and their prices seem to be the way to go for me. I've been using those ART P16 XLR patchbays for several years and have no complaints. I'm using them as a simple pass-through and they have saved me more than once from climbing behind my racks. I also made a few myself and in most cases it was the same price or more and in the end I think the ART P16's work better (and certainly look better). I do make most of my own cables/snakes (Redco was usually my choice for that). www.studiodrumtracks.com -- Drum tracks starting at $50! One option that I learned here is to use a stage snake with a female XLR box on one end, and then loose male ends to the pre's. I have an 8 channel, paid about US$50 and just bungee'd it to the side of the rack. It's US$70 now at the 'zon.